Valerie Eads (VE) is a member of the faculty of Humanities & Sciences at the School of Visual Arts, New York City, USA. She is also the organizer of the Matilda 900 sessions at the 50th International Congress on Medieval Studies, Western Michigan Univ., Kalamazoo MI, USA (May 14-17, 2015) and the Leeds International Medieval Congress (6-9 July 2015) where these papers were presented. Edward Coleman (EC), University College, Dublin, Ireland. Participants discuss the results of applying ‘new methodologies’ to some very old questions and suggest new questions to be addressed, possibly by using some very old methodologies. On the thing that is my own particular area of interest, the aspect of the interesting times in which Matilda lived – this is, of course, the period of the emergence of the communes in Italy, a fundamental change in the government and political regimes of all the major cities in northern Italy, including those, of course, under Matilda’s rule. And that was happening arguably for much of her lifetime if you think that the communes can be dated from, say, the 1080s. It certainly was well under way for the last two decades and more of her lifetime, the first two decades of the 12th century. And I think Matilda found herself in a position, and again it’s an interesting contrast to be drawn here, of being – how would one put it – maybe, at the receiving end of the emergence of the communes because what the communal movement did, it operated or effected a shift in power, a devolution of power away from the over-arching monarchical or marquisal authority that had pre-existed toward a much more localized collective authority invested in the cives of the various cities. And so in that respect, I think, Matilda of Canossa found herself, ironically, in a position similar to Henry IV in her relationship to the cities and the emergence of the communes. How do you, as the central authority or power-holder, how do you react to this call for – often a quite forceful movement – greater local autonomy? So interesting work could be done; no one has done this to my knowledge; scholars have talked about how the Empire, how Henry IV in particular, reacted to the communal movement, but not Matilda. There are plenty of documents so that type of study could be done. And a number of cities in which Matilda was much in control; Pisa, e.g., would be the earliest communal city, and the Canossa were much in control of property at this time. So, it would be interesting to compare and contrast the reaction of Matilda to the response of the Empire, of the imperial authority, to the rise of the communes. And the response, the default response of the imperial authority was to make concessions in the form of diplomas to the citizen bodies, the cives, sometimes to their representatives, the consuls, as Henry IV did to Pisa, the first one, the major one in the north and then to many other cities. The trade-off in these documents was almost always the same, which was that the imperial authority would grant away certain rights – of justice, or fiscal rights, sometimes particular pieces of land, the right to nominate their own officials – in return for acknowledgement of their authority. It seems to me in many respects the matildine reaction to the rise of the communes was very similar. If one thinks of the grants to cities such as Pisa or Mantua that Matilda made, it does seem that what is occurring is the trade-off between a grant of rights and recognition of authority over the city. The other thing I would say in relation to this – obviously one can’t enter Matilda’s mind and know what she made of this new movement, the communal movement – and in Eugenio’s paper reference was made to Chris Wickham’s book, Sleepwalking into a new world, the idea that people didn’t actually realize that there was a big change happening; it only became apparent later [Riversi 2017; Wichkam 2015]. I think, if anything, one might say, consciously or not, I would say again – with the caveat that I haven’t looked into this in detail or depth – nevertheless, consciously or not, Matilda in some respects facilitated the rise of the communes. How? Well if you think of one of her major, and this is a good example of where politics and ecclesiastical issues overlap, one of her major achievements, one might say, was the promotion of pro-reform bishops throughout her lands. In various emblematic cases – Anselm of Lucca... was a contested one shortly before that; as Eugenio mentioned Milan was a contested one, [Anselm IV of Bovisio] led the crusade [of 1101], and Dodo of Modena – these bishops were all effectively there because of the support Matilda gave them. And one of the key elements in the rise of the communes is the transfer of power from bishops to communes. So, in a sense, by undermining the lay power, the military power in particular, of the traditional imperial-appointed bishop, she was consciously or unconsciously almost helping the establishment of the communes. Matilda of Canossa – and we are here commemorating the 9th centennial of her death – at the time of her death was in control of a large patrimony in Italy, five counties and a marquisate by a conservative estimate. As has been noted, she had no heir; this was something that had been apparent for some time as when she died she was 69 or 70 years old. She had been deposed in 1081 by the emperor Henry IV, and since most of these titles were of imperial origin this was a significant act. And, finally, as has just been explained in some detail, the communes were rising. In other words, the world in which she lived and operated was changing. And yet, for as long as she lasted, she was able to keep control of all this territory, and it has been called with some justification the matildine state. She was actually governing. How did she manage to do this? She left behind her a good 40-year record of various actions that were undertaken at different times in support of the papacy or against those who were trying to depose her. If one looks for a military action, anything except a set-piece battle, one finds some record of it in the known acts of Matilda. These things have been outlined very neatly, chronologically, since the nineteenth century. And yet for those of us who interest ourselves in Matilda’s military career – I think it is safe to say that all of the scholars interested in this topic are here present – this to me is a matter of some concern, and not only for Matilda. There are a great many other women whose record is less extensive, but who are nonetheless well-documented. E.g., Coming up in September  at Ohio State Univ. there is a conference titled “Beyond Exceptionalism.” The only reason I will not be there is that I will be presenting a paper at the Congresso in Italy. I am firmly in the opinion we-have-far-more-exceptions-than-we-need-to-(dis)prove-the-rule camp. So we really need to start looking at women who exercise military power not as exceptions, but as part of the package. In my paper presented at the 20th Barnard Conference, I floated the hypothesis that instead of occasional anecdotes of women defending castles because the men were away doing something else, we should flip that to saying that the men were able to be absent because they knew they could rely on the women to carry out the defense. I don’t mean only that specific action, defensive siegecraft, but that the capacity of women to undertake some military action was taken for granted. The most spectacular case, Robert Guiscard, one of the most competent predators of his generation, definitely relied on the ability of his wife to back him up in the field [Eads 2005]. Now, we are not going to make a combatant out of Sichelgaita of Salerno who was at the time a middle-aged woman with ten children. This is not someone who is going to spend her days practicing martial skills, yet she was effective in the field in at least one recorded instance when she turned troops who were moving in the wrong direction – in other words, she issued a command in the middle of an action in the field and was obeyed. She also commanded at least one offensive siege on her own when her husband was elsewhere. So we have these things, and we need to get away from this kind of exceptionalism. Which leads me to another thought: there has been a lot of complex theorizing to explicate recalcitrant texts, and people are having so much fun with this that we are getting away from the nuts-and-bolts basics of the distance between point A and point B. Where did this woman get her troops and, by the way, what are they fighting about? If there is an army in the field, given the terrain and the people involved, how were they going to go about settling it? If there is a fortified position present, who was occupying it and how would one go about taking it? Was there any artillery in use, meaning of course, rock-throwing? I haven’t yet moved forward into the age of gunpowder. All sorts of things like that. Meaning map-in-hand, feet on the ground, nuts and bolts – obviously if you have a good GPS I’m not going to argue with that – but that sort of thing. How does one deal with these reports of women waging war in the Middle Ages? I presented a basic approach at the Society for Military History over thirty years ago in the form of two questions to pose concerning these sources. And the first question is, “Does it quack like a duck?” In other words, does it sound like a report of a military action, recognizing that medieval sources were seldom intended to be logical descriptions of such actions? If it quacks like a duck, one would want to consider that it might actually be a duck. The second question is, “Does it walk like a duck?” Can the action be plotted in terms of goals and the means of achieving those goals: available troops, the time involved, the terrain, available supplies, all of the basic issues? If this results in an acceptable scenario, if the source both quacks like a duck and walks like a duck, the burden of proof is on those who would maintain that it is not in fact a duck. And so I think what we want is more attention to those details, even though the attention we are paying to rhetoric – and today there was some discussion about scansion – is an obviously valuable tool since we can’t get anywhere without knowing what the source is actually saying. But, we do need to be able to map the accounts and discuss the actions within the parameters of warfare. And that is what people are largely reluctant to do. We have too many images and not enough Amazons, and this makes me nervous. When women talk about women waging war they are frequently talking about images, and when men talk about men waging war they are talking about bloodshed and guts on the ground. We need to be careful not to re-ghettoize ourselves. I think there are a couple of reasons for this, and here I have to go back to reminiscing. When I was still a grad student, I particularly remember one department meeting where a new student described her research interests as slavery and sexuality. The reason that I remember this is because later in the meeting when the department chair announced that, due to an impending retirement, we no longer had sufficient faculty to support military history as either a major or minor field she was one of those who gave smug self-satisfied smiles as though the department had been purified. Now these were not people old enough to remember the days of anti-Vietnam protests, and when that student announced an interest in slavery and sexuality no one had looked at her as though she had just announced a desire to own and sexually abuse human beings. So, there is that old cliché out there that those who study military history must somehow be in favor of organized violence and think it is the way coolest thing to do. Then, of course, there is the gender thing. We are all talking about women’s equality and so forth and so on, but no one wants to get into the details of how the woman we are talking about today, for whatever reason, did cause the deaths of a lot of people. She waged war. If you read in particular, and right now I’m reading Rangerio of Lucca, his point is clear. He does think this is way cool. He describes Matilda joyously cleansing her hands in blood and gloats about the number of the dead left unburied on the field. There’s lots of blood. And so we’ve got to deal with this, and if we ever want to integrate women into the ordo militaris we’ve got to pay attention to what they were doing. Soapbox away! I’m not sure if you’ve all read Dorothy Glass’s book, The sculpture of reform in north Italy. Interestingly enough, she argues that «there is no surviving, substantive evidence that Matilda was a major patron of any of the cathedrals or monasteries erected during her long lifetime, save for San Benedetto Po» [Glass 2010, 1-2]. And she further argues that we have to fight the desire to attribute all significant political and religious acts of the age to Gregory and Matilda and all sculpture, at least at Modena, to Willigelmo. Is Glass right? For my own part, I would note that the chapel that was destroyed in Parma in the riot of 1104 had been endowed by Matilda. Secondly, I would call attention to the diploma from the year 1100, when Matilda contributed to the building of the cathedral of Pisa (begun 1063, consecrated 1118). The document notes that Matilda contributed both land in the city (near the palace) and revenues for the building and restoration/upkeep of the cathedral. Glass does not mention Pisa because her focus is on the area north of the Apennines…but if Matilda was definitely patronizing cathedrals in Tuscany, and a chapel in Parma, is it really fair to say that there is no substantive evidence that she was a major patron of any of the cathedrals erected in her lifetime? And so, discuss: Is she right? Now, I have a few arguments against that, and maybe if we do talk about that I’ll [go into them], but the central question I’m asking is, “Are we over-estimating the influence of Matilda?” Should we be guarding against that? On a somewhat related point, we might also ask, were Parma’s walls actually pulled down in 1037, as the sources allege, but Robert Houghton has recently denied [Houghton 2012]? I don’t know the state of the archaeology of Parma’s walls, but I thought this might be something that new technologies– combined with old-fashioned archaeology – should be able to help with. Continuing with the wider question that Dorothy Glass raises, I guess in terms of new questions there is, “To what extent was Matilda’s victory over the emperor due to her own initiatives, character, etc., and to what extent was it the result of other factors?” Sometimes scholars have found a man behind the woman – I have argued against Arduino della Palude as the tactical mind behind Matilda’s victories [Hay 2008, 35-36]. – but as for other possible factors that may have led to Matilda’s success, Elke Goez seems to suggest that it was more the fortunes of war. She writes that even after the emperor’s failure at Canossa, the Canossan army was dejected and demoralized, and Matilda only with difficulty convinced her supporters to fight on at Carpineti – note that the council at Carpineti actually occurred before the engagement at Canossa – but then, from that point on, luck in war deserted the Salians so spectacularly that it was viewed by many as providential [Goez 2004, 371-373]. Again, I would argue that this interpretation is unfair to Matilda, who laboured mightily to bring about Henry’s defeat. A more serious argument is that the victory was primarily a political rather than a military one, due to things like papal diplomatic efforts, especially of Urban II, and more the product of events like the defection of Milan, Piacenza, Cremona and Lodi in the early 1090s, as well as the defection of the emperor’s wife and elder son in the aftermath of the emperor’s retreat from Canossa in 1092. And so those questions need to be revisited. Were these the things that really turned the tide of the war, rather than anything Matilda herself consciously did? That would ignore, I think, the many initiatives that Matilda had taken to make such defections possible, such as sending the squadron that freed Henry’s wife [Hay 2008, 144-146]. Another issue is what exactly happened at the crucial military engagement at Canossa in 1092, and I think Valerie Eads and I represent the two main camps: that Matilda’s forces did or did not execute a pincer movement against Henry’s army. I do not believe there was a pincer movement at Canossa, because if there were, how did Henry get to Bibbiano without passing through Matilda’s army? And what happened to Matilda when it did? Henry would have had to have gone through the force Matilda was leading from Bianello. Maybe there is, however, a solution. In her 2010 article on this expedition, Eads references the use of computer modeling to virtually reconstruct to reconstruct lost castles. Could we also use computer modeling technology to reconstruct the roads that would allow us to more clearly understand the movements around Canossa in 1092 [Eads 2010, 46]? Would this perhaps settle the question? Scholars have generally seen Matilda as the force that kept the communes in check. Is this pure speculation? In the final analysis, then, I think the case for Matilda being one of the prime movers of the events of her time remains quite a strong one. In a 1999 article, Jean Truax asked whether the Anglo-Norman countesses she was studying should best be seen as ‘valiant soldiers, prudent strategists, or charismatic leaders’ [Truax 1999, 111-125]. What if we were to apply this question to Matilda of Tuscany, who has been described as all three? I would argue that there is no firm evidence she was a soldier, and that her charisma was partly circumscribed by the limits of women’s decorum, as we can see with the charges leveled against her at the Synod of Worms and in the polemical literature. It is instead as a strategist that she was most effective, and thus most appropriately appreciated and remembered; indeed, she was one of the most successful commanders of her time. I’m going to build on one of the things that David has just said. The working title of this section was ‘I’m here to bury Matilda, not to praise her’. By this I mean that I think there’s been too much emphasis placed on Matilda’s role in social and political change during and after her lifetime. This may be unexpected given the nature of this strand and indeed this round table and I want to emphasise that I’m not trying to deny the importance of Matilda. Nevertheless, this is a point that needs to be made: the myth of Matilda is in danger of becoming the entire story for this period. To start with, as David and Dorothy Glass have demonstrated, there is a tendency to ascribe every religious monument in northern Italy to either the court of Matilda or the court of Gregory VII. This wasn’t the case, but it’s very often easy or interesting to assume involvement of either or both of these individuals. They were certainly both very active in this arena, but there have been several such monuments credited to this pair on very flimsy pretexts. This overstates their influence and builds their myth to the detriment of a more nuanced understanding of the political and social structure of northern Italy. We can take this much further though. We can see that in a lot of the narrative sources Matilda was presented as the driving force for many of the events of the Investiture Contest and that this has been carried over into several modern accounts. I think that we’ve taken Matilda’s importance here too much for granted, particularly when we consider events which only appear in Donizone. We need to rethink why these events are mentioned and why they are represented in this way rather than accepting Donizone’s account so readily. It’s not so blatant, but Matilda also often appears in the secondary materials as a major element in the emergence of the communes. This is generally either through her use of the nascent communes to support her own power, empowering them in the process, or else she is presented as a major retarding force against the construction of the communes as her central power prevented them from gaining strength in the way they did outside of her domain. However, I think we’re putting too much emphasis on Matilda’s role here. She certainly played an important role in some cities, but other factors must also be considered. Matilda’s supposed dominance has been extended to the role of reforming bishops in the Italian cities. The argument that Gregorian and Matildine bishops inevitably sought to relinquish their secular power does not hold water. These bishops could be just as worldly as their imperial counterparts, but we too often present them as reformers simply by virtue of their association with Matilda and the pious imagery attached to her by Donizone and others. Again, the situation was more nuanced than this, but was simplified to fit Donizone’s narrative and this simplification has been retained by modern authors. In sum, Matilda and the Canossans have been given too much prominence in discussion of the political situation in Italy which was much more complex than is normally acknowledged. Firstly, we often rely too heavily on Donizone. His is an attractive source, even if several section are difficult to read. And, as we’ve seen today, we no longer have any excuse not to use Donizone as we have a very good scan of the Vita Mathildis now available online. The Vita Mathildis is without doubt a vitally important resource but because of the nature of Donizone’s writing he inevitably presents Matilda and her family in a prominent role. We also have the survival and codification of Matilda’s charters in a very convenient (and widely available) volume from MGH. This provides an unparalleled resource for the court of an Italian magnate, but has the side effect of presenting Matilda as a political entity on a par with the German Emperors – the more typical subject of the MGH series. This easy access to Matilda’s documents means that the uniqueness of Matilda’s court and her role in the politics of the period has been overstated at the expense of other secular magnates and of the bishops. Finally, Matilda’s prominence has been exaggerated because she is interesting. Her life is an exciting story and is entangled with important figures and events. The vision of her standing firm against the Henry IV and his vast host, defeating him in the fog at the gates of her home, is just one of a plethora of narratively attractive incidents. She’s a well-resourced case study of an Italian magnate – a rare and usually poorly documented breed. She’s a very useful paragon of a woman taking on very traditionally male roles. She’s a deep vein for military historians, art historians and Church historians. However, a consequence of all of this is a disproportionate focus on Matilda’s role in the period in general. Very briefly I’d like to suggest a few things we can do to redress this. First of all: we can read the sources more thoroughly and return to the original manuscripts. As David has shown, by getting to grips with the actual document Vita Mathildis, we can uncover quite a lot of nuance that isn’t immediately apparent from the transcriptions. Secondly: we need to accept that Donizone is wrong, or at least misleading, more often than we would like. He wrote for very specific reasons. He had a great drive to achieve various goals for both his patron, Matilda, and his home monastery at Canossa. This affected how he represented Matilda and her family and the world as a whole – a fact which is frequently acknowledged but seldom fully incorporated into analysis. Finally: I’d like to encourage us to look at the charters (imperial, papal, matildine and episcopal) more thoroughly to corroborate or confirm the evidence in the narrative sources. Moreover, the charters should be used as the foundation of our narrative on Matilda and the period as a whole. These documents are far from immune to the type of rhetoric we find in the narrative sources, but they’ve not been used as thoroughly as they could be. These methods do not undermine the importance of Matilda, but place her more firmly in historical context. I know why this group is small, and it ties in with what I’m going to say; they’ve all gone to see the Joan of Arc film. My ideas tonight have arisen from some words written by Diane Owen Hughes, and some of you may have read them [Owen Hughes 1987, 25-57; quotes 35-36]. And I will quote her briefly. The Risorgimento [the movement which led to the unification of Italy as an independent state with its capital at Rome in 1870]... did not allow space to aristocratic women who had made a mark on the history of their age: for their power was based in family privilege and their virtue –when they possessed it – had been shaped more by ecclesiastical than by civic ideas. Matilda of Tuscany, one of the most effective rulers in post-Carolingian Europe, had been a difficult heroine for the towns, which, even if they had received concessions from her, took advantage of the power vacuum created by her death to assert their sovereignty. She says more, and I will pick up some of her ideas. Countess Matilda was a renowned supporter of church reform in the late-eleventh and early-twelfth centuries. She supported seven popes unstintingly. Many people either acclaimed or feared her during her lifetime. Marchioness, countess and dux (leader) of territory stretching from Garda in the north to Tarquinia south of Rome, she was called in praise ‘most prudent leader and most faithful warrior of St. Peter’, ‘daughter of St. Peter’ and ‘virago’ in her lifetime. 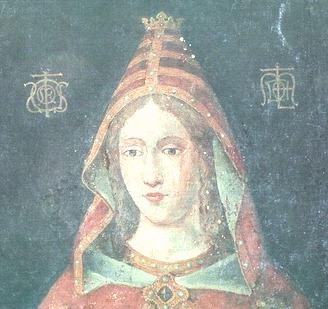 Whether her friends or enemies, the many who wrote about Matilda either in her lifetime or shortly thereafter acknowledged her as a formidable leader and ruler, who was effective in turning the tide of battle in support of church reform against the opposing German king/emperor Henry IV. Opinions about Matilda have fluctuated over the past nine hundred years from extravagant hero worship to deep dislike or, indeed, to her disappearance from awareness to a great extent in the English-speaking world. She is not so well-known, unlike Joan of Arc, and we have to ask why, as Diane Owen Hughes asked. The two women have, at least superficially, similar characteristics in that they are heroines, they are military, they are different, they are despised, they are liked. Everyone has heard of Joan of Arc; not too many people in the English-speaking world have heard of Matilda. However, let’s come to the Renaissance. In the Renaissance states we are looking again at dynastic rather to republican principles, and so Matilda’s life really resumes here. And we have to remember that this is the time, four hundred years after her death, when the pope sent his messengers to San Benedetto Po to steal her body, and she is now one of the five women buried in St. Peter’s basilica in Rome. And this is the Renaissance idea, she’s coming back. But just as the communal growth of the twelfth century had deprived Matilda of political descendants, so the development of an antiaristocratic, anticlerical, national ideology in the nineteenth century diminished her place in the history of a new nation. Unlike the Maid of Orleans, a female leader whom republicans could accept as a genuine savior of the nation even after France had cut its ties with a royal and Christian past, Matilda of Tuscany was for nineteenth-century Italian reformers the embodiment of that past from which they sought to extricate their new nation. Joan of Arc, free of family and abandoned by the church, could be molded into a secular saint by the fiercely republican Jules Michelet. Matilda, loyal daughter of the pope and upholder of the interests of her house, necessarily found no equivalent Risorgimento hagiographer. So I’ll leave that as it is, and I would like to comment, while I may, on Donizone. I think you’re right. We need to study the charters – and I’ve looked at the charters quite a lot – I think that’s very true, but I think it’s unfair to dismiss Donizone. Yes, he was building up the house of Canossa, that’s true, but let’s look at Widukind of Corvey building up the Saxon house or Thietmar of Merseburg, protecting his bishopric, building up the house of Henry II. They were all doing that, and I don’t think we need to be more careful of Donizone than we are of these other people. He’s often criticized and sometimes, I think, unfairly. That’s me! Helen Nicholson: OK, we have about twelve minutes – that clock’s slightly fast – for discussion, and at this point I’d like to throw it open to the floor for any comments, although obviously the panel may also speak. Please, though, not everybody at once! Any thoughts you’d like to contribute? John Oastler Ward: A few things occurred to me, the answers may be simple. Just an aside on whether anybody who studies weapons believes in killing, my pseudo-son-in-law is a tremendous fan of tanks, there’s nothing he doesn’t know about tanks, but he won’t even tread on a cockroach. But thinking about the things that were said – and the answers are probably all in the books I haven’t read – but one wonders in what ways did the cities contribute monies to their overlords? How was Milan governed in this period? I don’t recall any references to communes. And what were Matilda’s major sources of income? Did it come from renting lands or agricultural produce or overlordship of cities or what? VE: A significant chunk of it was the trade along the Po... anyplace you wanted to tie up your boat and do business, and all of the cities along the tributaries she also controlled. River trade was very important, and basically everything she had a hold of was a trading port. This is one of the things Donizone emphasizes, that she «guarded the road of the Po». In my article, that David has commented on, I approached things from Henry’s point of view, his objective in his last campaign against Matilda, and concluded that he was trying to cut off her revenues by systematically quartering her territory and occupying of these revenue-producing points. JOW: And taking the money himself? VE: Basically cutting it off from her; he was probably having to distribute it to others, but without those revenues she wasn’t able to pay troops. Another corollary is that a great many of her troops were paid. JOW: She must have had a considerable bureaucracy running all this. VE: Yes, her chancery. We know much more about her chancery than about her castellans. JOW: What about land owning, the actual land itself, the five counties? Did she make money from just straight agricultural produce? Did tenants pay rent or do corvée? VE: She could collect all kinds of rents; she had very favourable contracts for land that she herself held in fief; this was the sort of thing that her father was infamous for, the emphyteutic contract, like the buck-a-month rent, and she inherited all that; and when it was safe for her to do so she started undoing it quite systematically. The number and location of places that were her property, and in the nineteenth and early-twentieth century scholars went to brickbats over what were her allods and what were her fiefs, and she had large chunks of it. JOW: The knights would have been landed vassals of hers; they held lands in return for service. VE: Yes, the problem was that if a lot of them held of her in her office, as count of Mantua or Ferrara or whatever, when Henry dispossessed her she was in a very precarious position. One of Pope Gregory’s letters comments on this. JOW: That’s all fascinating and, again, you begin to wonder how other overlords managed and Henry himself. These are all things I should know, and they’re very nitty gritty basic things that you often forget or take for granted and yet they’re terribly important. Presumably, Henry IV was in the same position. When he was very low, he was very low. And all of these properties, ports, lands, fiefs and so on were viewed as revenue-producing, and whoever had them got the revenue. EC: A great many of them came under the term regalia. And that covers all that kind of thing – the commercial tolls, judicial fines, the [proceeds] of offices, the courts – the whole range of things that you were talking about, and those were almost all historically due to the crown through the crown’s representative, and that’s what the argument was about. And that is why the commune was so important, because that is usurping them, taking away from the rightful ruler and redirecting the revenues to the cities themselves. And that is, ultimately, what Frederick Barbarossa is trying to do later on when he comes to Italy and proclaims the Diet of Roncaglia. It is a war of regalia. He presents a big list of regalia – these are all the things that are all due to me, and [the emperors] haven’t been getting them for two generations – and it was the same with Matilda, for example, in the March of Tuscany, the Canossa were getting all this. VE: Some of the churchmen who supported the reform could be counted on to continue to pay their duties to her. It was important. JOW: And presumably, somebody made reference to bishops ruling their cities, they would have possessed regalia too. EC: The administrative regalia, on behalf of the crown; that was the deal. VE: The problem here is that Henry, being an excommunicate, what were their duties to him? And this was a large chunk of the excuse for simply ignoring his rights. People considered who was going to come out on top. The whole point of all this was to bring Henry back into obedience and back into the fold meaning that he could resume his rule, and, if you had treated him as a non-person when he was excommunicated, what do you think he was going to do when they all made up? There was a lot of that. JOW: Now, my last point, Milan at this stage was ruled by the archbishop. DH: Not the actual word; (commune) is not used until later. EC: The word itself is very rarely used. Again, and it’s a great study of this from the point of reference of the whole issue of communal origins, Chris Wickham’s book which has just come out surveys the emergence of the communes in northern Italy. There’s a case study of Pisa and the Canossa and of Milan; there’s a whole chapter on Milan with all you need to know. And Rome as well, actually enough, he includes Rome in the communal movement which is very rarely thought to be part of that or discussed in terms of the communal movement. It has a very interesting chapter comparing the smaller cities in Tuscany. Just to get to the rulership issue, in all cities there was a transition period between episcopal or archiepiscopal and communal rule, often in parallel, sometimes in conflict. In the case of Milan it seems to have been largely in parallel because the archbishops were immensely powerful in the early, in the eleventh century and, despite all the interruptions to the office, in the transition period which would probably be the first two decades of the twelfth century what one begins to see is the emergence of new institutions of civic governance which weren’t there before. Which are variously called parliament or [arengo] or assembly of the citizens. In the case of Milan in 1117, one of the first times this is mentioned in Milan, they set up two stands or benches. On one side sit the archbishop and his advisors, the canons, and on the other side sit what are called «the men expert in law», the civic officials, and they are clearly working in tandem. JOW: I see. That clears it up. And of course this means that Gregory is playing with fire because these bishops whom he wishes to wrench from the control of Henry IV have extensive regalia. HN: We’ve been talking about ten minutes without mention of Matilda! This actually negates what you just said Rob, that we spend too much time talking about her. RH: I think we’ve made marvelous progress! VE: Seriously, I think this is a really important point because when someone is made too important I think they are made into a cliché. It’s like trying to get minority students – and this is in the U.S. of course – to pay any attention to Sojourner Truth because she has been made into the standard figure of A Black Woman. Young people who have never read her speech just say, «Oh yeh, we know all about that», which they don’t. And we do risk doing the same thing if we make Matilda of Tuscany the standard bearer of martial women, nobody will pay any attention to this. PN: Shouldn’t she be replacing Joan of Arc? VE: Joan is completely different; Joan’s appeal is that she’s dead, a gory heroic figure who died, a completely different animal. VE:... who has never had a good movie. EC: That would be Eugenio’s point as well. Trying to deconstruct Matilda requires getting away from thinking of Matilda as a single person and instead thinking of her domus, her court, the monks whom she patronized, the various monasteries, her bishops, her vassals and supporters. All of these people are not singing from the same hymn sheet all the same time. I think it is an important point that they all have their own interests. RH: Speaking to what Penny said, you’re absolutely right, Donizone is far from the only person who is praising his patron in this manner; that doesn’t undermine any of what I’ve said though. PN: No, but you were picking him out. RH: So … There have been a couple of names mentioned so I really need to catch up on what has been said about Matilda. I have it in my head that they didn’t say as much as Donizone and... this fantastic image of this warrior queen, basically. But I’m sure it’s more than what I’m allowing for so I’ve fallen into the trap that I described. JOW: Well, yes, but also a vassal who is not doing what vassals ought to do. VE: In her case what she should have been doing is sitting there waiting for cousin Henry to tell her whom to marry next. JOW: Yes, as well as to pass on all revenues and so on. PN: And that wasn’t going to happen. VE:... and we can go drink to Matilda in the pub! Die Urkunden und Briefe der Markgräfin Mathilde von Tuszien, Goez E. and Goez W. (edds. ), Monumenta Germaniae Historica, Laienfürsten- und Dynastenurkunden der Kaiserzeit, 2, Hannover, 1998. Rangerius of Lucca, Vita Anselmi Lucensis episcopi auctore Rangerio Lucensi, Sackur E., Schwartz G. and Schmeidler B. (eds), Monumenta Germaniae Historica, Scriptores, 30.2, Hannover, 1934. Eads V. (2005), Sichelgaita of Salerno: Amazon or trophy wife?, «Journal of medieval military history», 3: 72-87. - (2010), The last Italian expedition of Henry IV: re-reading the Vita Mathildis of Donizone of Canossa, «Journal of medieval military history», 8: 46. Glass D. F. (2010), The sculpture of reform in north Italy, ca 1095-1130: history and patronage of Romanesque façades, Farnham: Surrey. Goez E. (2004), Welf V. und Mathilde von Canossa, in Welf IV. Schlüsselfigur einer Wendezeit: regionale und europäische Perspektiven, Bauer D. and Becher M. (eds. ), Munich, 371-373. - (2012), Mathilde von Canossa, Darmstadt. Houghton R. (2012), Representations of collective action in Mantua and Parma, c.1000-c.1120, PhD Dissertation, University of St. Andrews, 2012. Hay D. J. (2008), The military leadership of Matilda of Canossa, 1046-1115, Manchester. Owen Hughes D. (1987), Invisible madonnas? The Italian historiographical tradition and the women of medieval Italy, in Women in medieval history and historiography, Mosher Stuard S. (ed. ), Philadelphia. Riversi E. (2017), Matilda and the Cities: Testing a “Figurational” Approach, «Storicamente», 13: no. 16. Truax J. A. (1999), Anglo-Norman women at war: valiant soldiers, prudent strategists or charismatic leaders?, in Kagay D. J. and Villalon L.J. A. (eds), The circle of war in the Middle Ages: essays on medieval military and naval history, Rochester, NY, 111-125. Wickham C. (2015), Sleepwalking into a new world: the emergence of the Italian city communes in the twelfth century, Princeton. 1. Beyond Exceptionalism, 18-19 September 2015, The Ohio State University, Mansfield; XXI Congresso internazionale di studio Matilde di Canossa e il suo tempo (San Benedetto Po, Revere, Mantova, Quattro Castella, 20-24 ottobre 2015). 2. War and Peace in the Middle Ages and Renaissance, 6 December 2006; Valerie Eads, “Means, Motive, Opportunity: Medieval Women and the Recourse to Arms,” http://deremilitari.org/wp-content/uploads/2012/09/Eads-MeansMotivesOpp.pdf, accessed 27 June 2016. 3. Rangerius of Lucca, Vita Anselmi Lucensis episcopi, ll. 3786, 6560-62, 6613-14; 1236, 1293, 1294. 4. Die Urkunden und Briefe der Markgräfin Mathilde von Tuszien, no. 63, 190-192. 5. See also, although without apparatus criticus, Goez 2012. 6. Owen Hugues 1987, 36, quoting Benedetto Lucchino (1592). 7. Wickham, Sleepwalking cit n. 1.